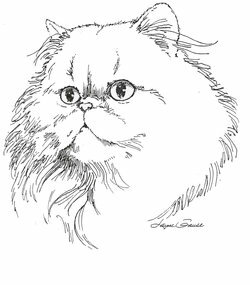 Officially incorporated in 1918, Cleveland Persian Society is the Cat Fanciers Association's (CFA) 2nd oldest club and has produced shows since it was incorporated. At the present time, Cleveland Persian produces two shows per year, the third weekend in January and the third weekend in November. Our shows are at the Lakefront Arena, 5310 Hauserman Rd, in Parma, Ohio and have been there since 2005. January is usually the larger show attracting pedigreed cats from all over the US and Canada and our October show is usually a smaller fun show attracting local exhibitors. These are All Breed shows meaning we will have not only Persians but 42 other breeds of cats including household pets or non-pedigreed cats. The shows are run and scored according to CFA's show rules. Our goal is to put on quality shows. As a CFA member Club, we support the CFA every way we can. We support the Annuals (which is our annual meeting and awards banquet), the International show and the Great Lakes Region show not only with financial contributions but also with manpower. More importantly, we support local and regional rescue operations shelters and the Winn Foundation. Our members are CFA breeders and exhibitors. To encourage the breeding to standard of both the longhair and shorthair cats. To hold shows and promote interest in and knowledge of cats through education. To cultivate sentiments of friendship and common interest among the members. To advance in every way possible the interests of breeders and exhibitors and to promote the welfare of all cats.